Happy to come up with a brand new Polaroid story for you all to enjoy on this sunday evening. 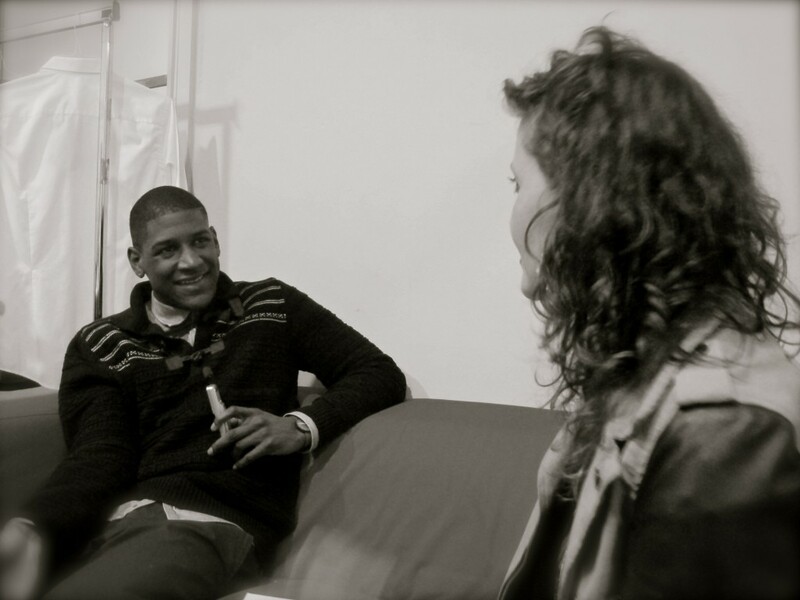 Meet Timothy Mckenzie, better known under his stage name as LABRINTH. If you’re not familiar with this young individual, nicely Polarized here above, let me be so kind to introduce you to him. At the age of only 23, this young bloke from Hackney, London is currently turning major heads in the music industry, news papers labeling him “the new Timbaland”, and international artists are supposedly queueing in line to work with this multi-instrumentalist. But let’s start with the very beginning. Labrinth comes from a very musical family, his brother plays drums for Tinie Tempah and his sister is a vocalist for British artists like Terri Walker and Wretch 32. However, Labrinth’s first contact with music was through Gospel which was a standard in the Mckenzie household. It was his brother, also a producer, who introduced him to the magical place that is the studio and Labrinth, who was 15 at the time started to work on music. By the time he was 19, he managed to co-write and produce a full on hit for British rapper Tinie Tempah called ‘PASS OUT‘ and as any decent producer does these days, starred in his first video feature amongst one of the UK’s biggest stars. The ‘Pass Out’ track was rewarded with a British music award for ‘Best British Single’ at the 2011 BRIT Awards and went platinum, selling more that 600.000 copies. Not bad ‘innit’? That was only the beginning for Labrinth, who released his own solo debut a few months later, introducing his track ‘Let The Sun Shine’ to the world. Check out this lovely acoustic version, a little showcase that proves that Labrinth is pretty at ease with just a guitar and his voice. Meanwhile, after a little label bidding war, Labrinth surprisingly signed to none other than Simon Cowell’s SYCO label, (Yes, thé notorious Simon Cowell ) which made him the first artist in more than 6 years that didn’t come out of the whole ‘talent show pool’. The second single of his debut album and the pretty impressive video that came with it, was a clear statement to the world, that LABRINTH was here to stay, ready to steer the world with his music and this time Tinie Tempah returned him the favor with a feature on his ‘EARTQUAKE’ track. Things need to evolve for young Timothy, so he started his own label called ODD CHILD on the side, signed his first artist, singer Etta Bond to his label ànd somehow manages to have some spare time left to open his own restaurant, Mosaica. ALL AT THE SAME TIME! Productive fella, this young Labrinth. Now, let me tell you the story behind this Polaroid. Untill a month ago, Drake was touring Europe with his Club Paradise tour and initially it should have been Kendrick Lamar and A$AP that would open for Drake during his European tour. Now, plans changed and it was only days before that it was communicated that none other than LABRINTH would open for Drake his show in Brussels & Paris. While I was calling and mailing around to find myself a way too Drake, I had the request from SONY if I wouldn’t be interested in meeting LABRINTH. I’m always curious about new talent and my attempts for Drake were getting nowhere (more about that later) so I signed up for it. Doing this blog for some time now, I’m used to be completely at my own, with no support what so ever in order to reach the artists that I want to snap on Polaroid. I’m very happy that a label like SONY believes in this blog and makes things easier once in a while. And so it happened, a few hours before the concert I was nicely guided trough the maze that is called VORST NATIONAAL, one of the few venues in Belgium where it is still IMPOSSIBLE for me to sneak into independently, unless of course, you have some sort of secret alliance with the Vorst Nationaal security staff. Which I have not. Obviously. Last time I was in those same hallways, Drake was also headlining and I had a lovely conversation with J COLE, remember? 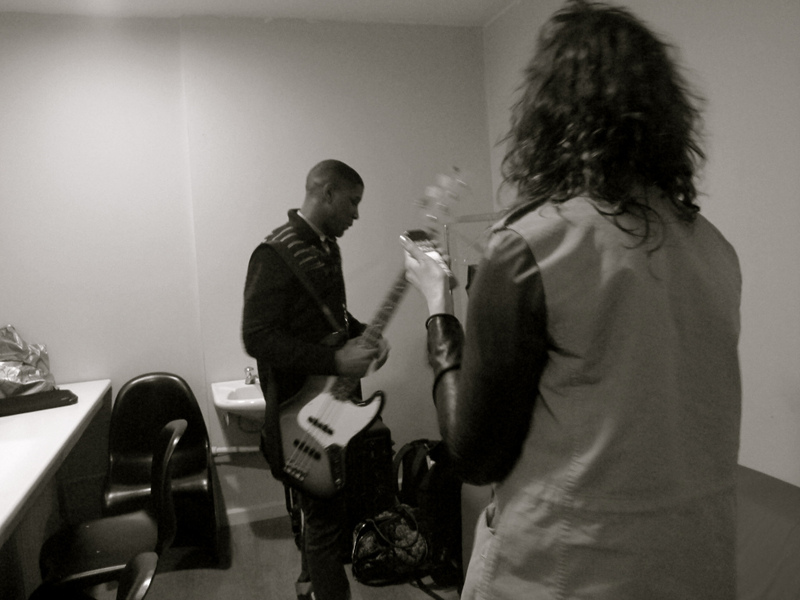 I had the opportunity to have a little chat with LABRINTH, so I walked in a tiny backstage lodge where I found myself right in front of a dapper looking guy with a guitar in his hand. You could immediately tell that the thing is probably glued to his hand most of the time. I introduced myself and my blog to him and while I was nervously looking where the heck (?!!) I wrote down my questions in my ‘interview note book’ he just started talking about…everything really. Which is nice for a change, mostly I have to warm the artists up for a conversation, which is always a bit of a challenging process, mainly because most of them are fed up asking questions by the time I arrive. Hello Labrinth, welcome to Belgium. Ever been here before? You’ve been working in music since a very young age and in the UK you are slowly growing into a legit super star, but could you please introduce yourself to my readers who might not be familiar with you? Ofcourse. I’m Labrinth, I’m a producer, writer, artist, a musician, and basically, I build my name in the UK by producing Tinie Tempah, I produced two of his records, (Pass Out & Frisky), so if you ever heard someone singing on those songs, well, that was me! I’m just a guy who loves music, and where ever I can go with music, that is where I will go. That’s who I am. Your real name is Timothy Mckenzie, but your stage name is LABRINTH. I know it’s a cliché question, but could you please elaborate a bit on your stage name, why Labrinth? Well, they say ‘Live is like a maze’ and for me it was like, why not call myself ‘life’ but in a very weird way. The word stuck with me and it works with the way I am now and the way I produce music. I don’t have a…style. When you listen to my music you’ll probably get lost in what I’m about. That’s why it became Labrinth. You were born in a very musical family and raised with a serious amount of gospel music. What’s your favorite gospel song of all time? I always used to listen to Kirk Franklin, what is called, uhm… STOMP! That was a big record, definitely one of my favorites. Eearthquake, is the second single from your album Electronic Earth, can you tell me something about this album? The album is me being every artist I ever wanted to be. It has a lot of variety when it comes to terms of music. It’s definitely on more of the commercial music side but it’s basically me, mixing all genres that I’m into. It’s called Electronic Earth, because I live for electronic and acoustic music and mixed them both together. Some people see a house DJ, or hear some dub step and think: “that’s it”. I’m like, no man, that is not it. I’m putting it all in one. …meanwhile you worked with quite a few artists like Ms. Dynamite, Ellie Goulding, Yasmin, Pixie Lott. You produce, you sing, you play a bunch of instruments, I suppose you’re a great dancer too? (laughs) Well…yeah, I have some moves. …so, all the labels aside, what do you consider yourself the most? What is the most important for you from all those different elements? I can imagine that it must be a very scary transition, after all, in the studio you work a lot by yourself and then all of a sudden you have to throw your music out there and stand before your audience. Very true. The studio is a very anti-social place. See, the thing is, you can make your music, and people can hear your music and feel the character of your music, but to bé the character of your music and to be the fàce of your music, that’s a whole different thing and I see a lot of DJ’s and producers standing behind desks and plày it, but they do not perform it. Was that a process? Or was that something that came quite easily to you? Definitely a process! I was performing before I was producing, but I was rusty as hell. I didn’t have it. Then I spend a year performing everywhere we could, I mean everywhere. And it build up from there. So. You are signed to Simon Cowell’s label? Yeah, I know, I’m heading that direction here. (laughs even more) I love it! It’s pronounced SYCO as in ‘psycho’ not as in ‘sicko’ right? (bursts out laughing again) yeah. more like psycho. Now. About Syco. Is it a blessing or a curse to be signed with this label, considering Simon is a very business savy yet quite commercially driven individual. It’s both. You know what, wait. It’s actually a gift. The reason why it is a gift, is because I have fùll creative control over everything I do. So ànything I want to do, I can do it. If I wanted to like…start working with The Roots. I could start working with The Roots. It’s good man. That is what I am there for. And it is like you said, he is business savy and he is able to take my music where I want it to go. Tonight. You are opening for …DRAKE! How does that feel? Seriously? S I C K !! Amazing. Definitely a fan of his records. ‘Over’. Big record. I also think that his lyrics are amazing. If you could name 1 person that you’d love to dive into the studio as in – tomorrow – to make music with, who would that be? Sam Cook. David Bowie. Little Dragon. What are you currently working on or working with? Any artists outside of the UK maybe? I spoke to Busta Rhymes today actually. Yeah, we have a version of ‘Earthquake’ out in States now, and he is on the US version of it. Busta Rhymes can destroy a record, you know that. There is also a remix version on my album with Busta, Kano & Wrench32. 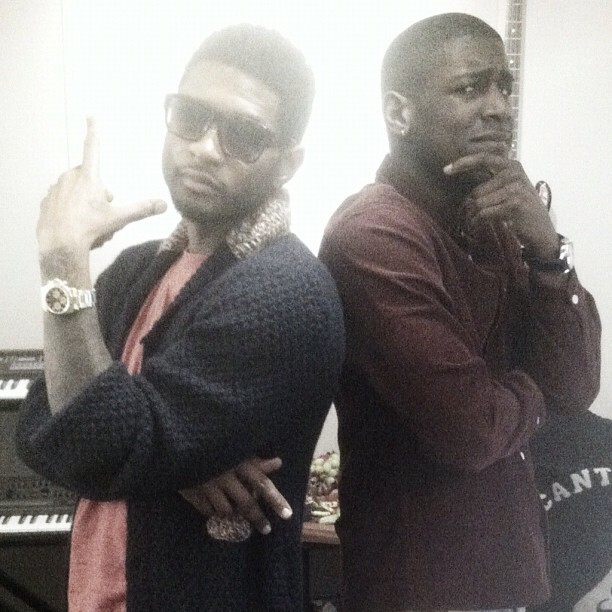 I worked with Usher not too long ago as well and we are working on some stuff. I might be old-fashioned or simply old, so I prefer the old Usher more than the new, but his recent ‘Climax’ track really puts him back where I missed him for so long. A lot of people are feeling that with Usher. I think, sometimes you have to go where you don’t want to go, to find out where you do want to go. And Usher did that. I personally don’t favorite the sound that he went for,but I think it took him to a place where it is healthy. And hopefully he keeps developing in that way. Last question. If I say Belgium, what 3 words pop up in your head? 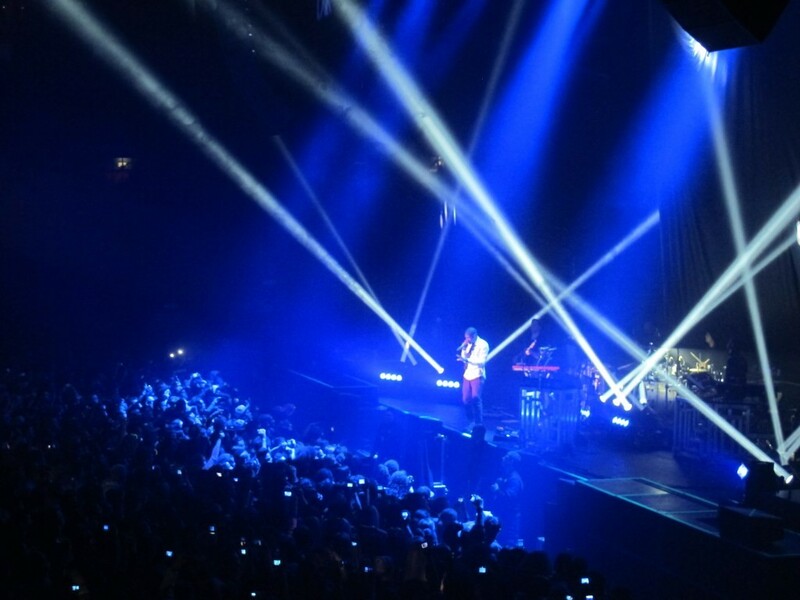 You can follow Labrinth here and here.